Adults and kids all crave a sweet pick-me-up. 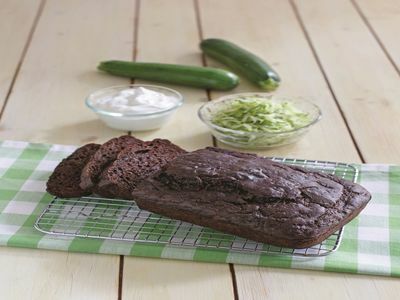 This yummy Chocolate Zucchini Bread from MOM’S SUGAR SOLUTION is the perfect guilt-free treat to satisfy your sweet tooth. Bring a slice to the office or pack one in your child’s lunch box for a hearty snack. This Chocolate Zucchini Bread is rich and moist and flavored with unsweetened cocoa powder for that chocolate intensity that kids (and adults) crave. But you can feel good knowing that each slice has 3 grams of fiber, providing more than 10 percent of the daily value of this often underconsumed nutrient. 1. Preheat oven to 350°F. Grease a 9″ × 5″ loaf pan with 1⁄2 teaspoon canola oil. 2. In a large bowl, stir together flour, cocoa powder, baking soda, baking powder, and salt. Set aside. 3. In a separate large bowl, whisk together eggs, remaining oil, yogurt, sugar, agave, and vanilla. 4. Add the flour mixture to the egg mixture. Stir to combine, about 2 minutes. 5. Fold in zucchini using a spatula. Pour into the prepared loaf pan. 6. Bake 50–55 minutes or until a toothpick inserted in the center comes out clean. 7. Let cool 10 minutes before removing from the pan. Use a bread knife to cut into 12 slices. Serve warm. 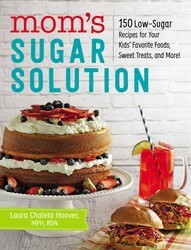 Tame your sugar cravings with these simple, low-sugar recipes that emphasize natural ingredients and support healthy eating habits for you and your family.In Mom’s Sugar Solution, you’ll learn how much sugar is acceptable, how to spot hidden sugars on food labels, and how to get your family involved in a low-sugar lifestyle. With advice from family nutritionist Laura Chalela Hoover about the best ways to minimize sugar in a child’s diet, you can be sure you’re making the right decisions for your family’s health. You’ll find 150 kid-friendly recipes for everything from breakfast to dessert, as well as recommended swaps for foods containing high amounts of hidden sugar, including drinks and condiments. With easy and delicious recipes that range from Peachy Cream Pancakes, Cinnamon Smoothies, Corn Bread Mini Muffins, and Crispy Fish Fingers, Mom’s Sugar Solution makes it possible to eat healthier and still enjoy the foods you love.